I recently answered Valerie’s first question about her messy baker’s rack, so now we’re moving on to her office mess. Valerie, I can definitely help you out! If you spend several hours working quickly, you should be able to have your office down to what feels like a much more manageable level. I recommend carving out two large sessions to clean – the first to pare things down and pile like items together, and the second to really organize what’s left and get a better system in place. Let’s start with your computer – do you still use that monitor? If not, take it to Good Will or a local recycling center! Some computer shops will also wipe hard drives clean for free in exchange for your old computer parts (trust me, that’s a good deal). Then let’s move on to the laundry situation – it doesn’t seem like you have a ton of laundry in there, but pile all of it into one spot. Quickly make three piles – donate, keep, unsure. Bag up donation items and immediately put them in your car. Quickly fold or hang the things that are in the keep pile and put them away. Go through the “unsure” pile again and see if you can pull anything else out to donate. You can place the rest of the “unsure” pile to the side for now – those are things you’ll decide on during your second cleaning session. For more laundry help, check out this article I wrote in answer to another reader’s laundry dilemma. Once you have your laundry under control in your office, go ahead and start on the paper clutter. Refuse to allow yourself to get discouraged because you can totally do this! Go through one box at a time and toss, toss, toss! Remember that if you haven’t needed it for however long it’s been in those boxes, then you can probably get rid of it. Organize your papers the same way you did your clothes – three piles. Shred, keep, unsure. Don’t take a long time looking at everything. If you’re not sure if you need to keep it, then put it in the “unsure” pile! 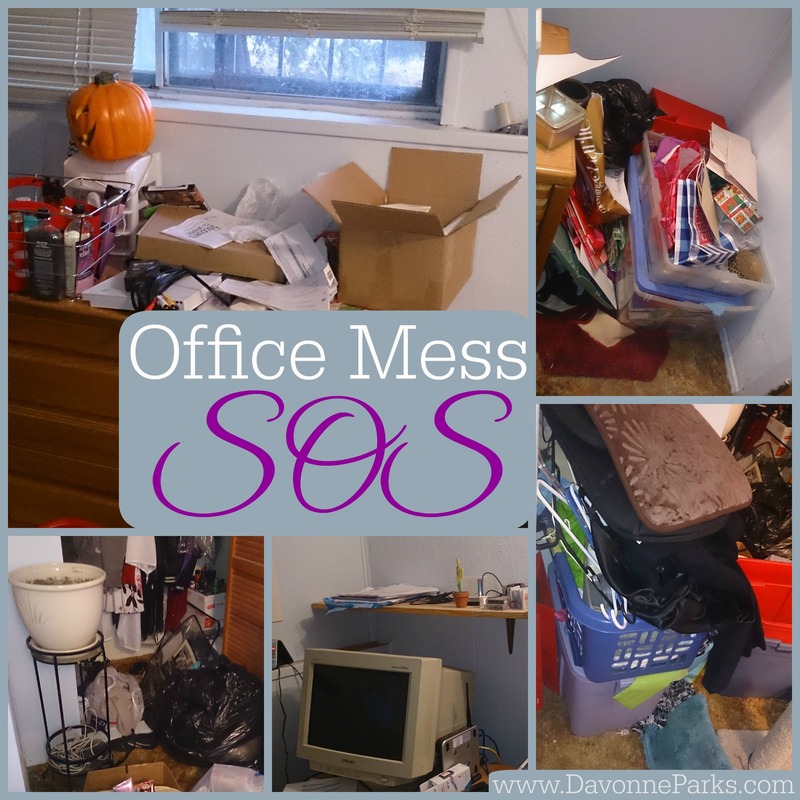 I wrote a detailed article about taming the paper clutter, so definitely take a few minutes to read it because I included great tips that will help you to very quickly get your paper piles under control. While you’re reading the paper clutter article, don’t miss the free printable I linked to, which will help you know when you can shred old documents! Once you’re finished quickly getting your paper clutter pared down, box it all up and put it in one pile in the corner. Then walk around the rest of the room, quickly pulling things out for donation or trash. Put everything else into piles or bins in the corner of your office. By the time you’re done with this step, you will still have some piles around the room but they should feel manageable, like clothes, papers, etc. Plus your office should look much better! Stop there and rest – that was enough decluttering for one day! Whether your second session is the next day or several days after the first session, just pick up where you left off. Turn on some music that you enjoy and mentally prepare yourself to make some decisions! While you’re deciding what to keep and what to get rid of, remind yourself that if you haven’t needed it in the amount of time it’s been buried, then you can probably safely let it go. Purge, purge, purge! One key to having a nice, organized space is not having too much. Go through everything that’s left, but don’t pull it out all at once – just sort one box at a time. That way if you need to stop, you won’t have a bigger mess than what you started with. Dani wrote a fabulous article about organizing the home office, so be sure to read that because it’s full of tips that are absolutely perfect for day two of organization, and her ideas are beautiful as well as functional! I hope this helps you, Valerie! Let me know if you have any more questions about this space once you begin organizing and please send after photos when you’re done!